Valentine’s Day always brings out the crafter in us. 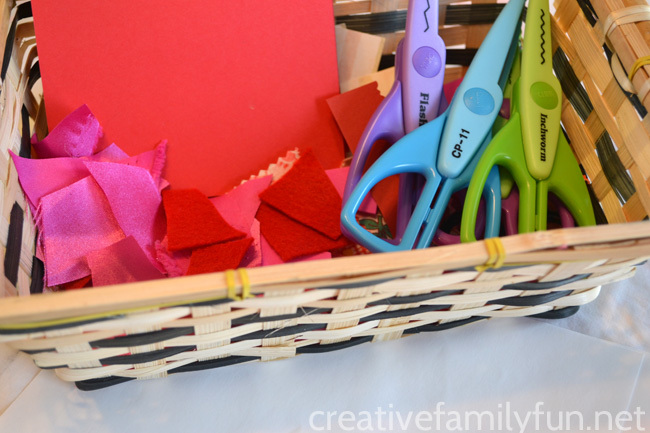 We love to get out the red and pink paper, scissors, glue, doilies, stickers, and every odd and end imaginable. Sometimes the result is just a lot of fun time creating. 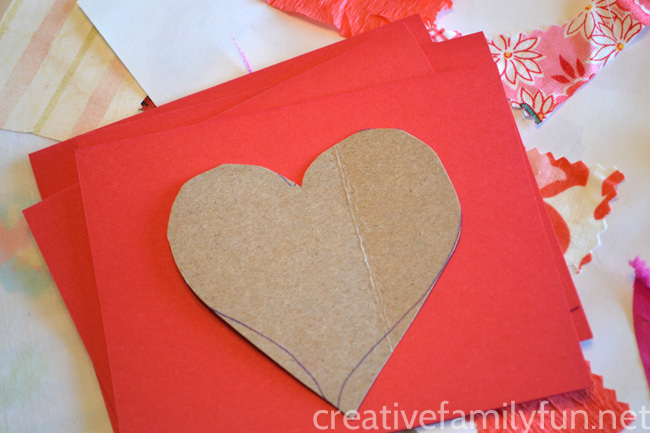 And, sometimes the result is a pretty Valentine’s Day card we can send to family and friends like these Heart Collage Valentines. For this craft, we used our scrap bits and pieces to make some amazing collages, which we then transformed into simple cards. 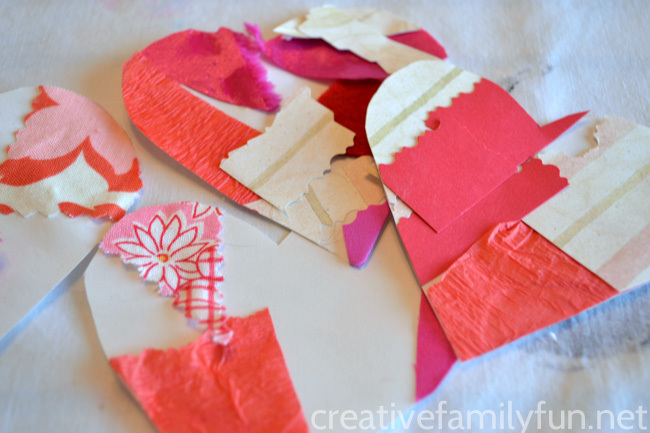 When we got done, we had created these pretty Collage Heart Valentines. Our first step was creating our heart collage. I presented my girls with a basket that was full of collage materials, all of which were either pink or red. We had shiny fabric scraps, felt pieces, scrapbook paper, magazine cutouts, pieces of red crepe streamer, and just about anything we could find in our crafting stash. The girls arranged and glued until they were satisfied with their Valentine collages. While we were waiting for our collages to dry, we folded our cardstock into note cards. If you plan on mailing these cards, simply cut them to fit in whatever envelopes you happen to have at home. Then, using some scrap cardboard, we made a heart template to use for cutting our collages. I made a heart that was big enough to fill the space on our cards because we wanted only one heart collage per card. After our collages were dry, we traced our heart template to the back of our collages. Note: If you trace the heart on the back, once you cut it out you won’t have any pencil lines! Finally, we glued our hearts to the front of our note cards, added a special message, and our Heart Collage Valentine cards were ready to go! 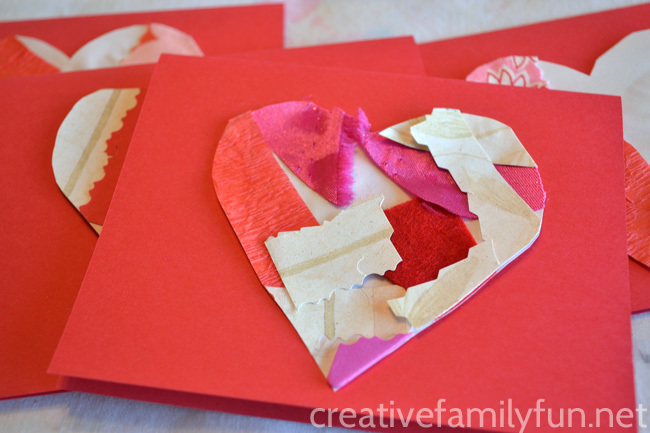 I love how a simple collage turned these hearts into works of art! 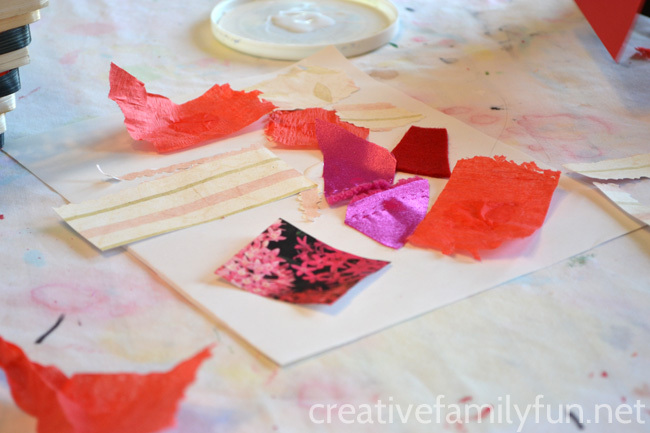 This Valentines craft was so much fun to do. It’s perfect for both a large and small group of kids. What kinds of Valentines are you sending out this year? 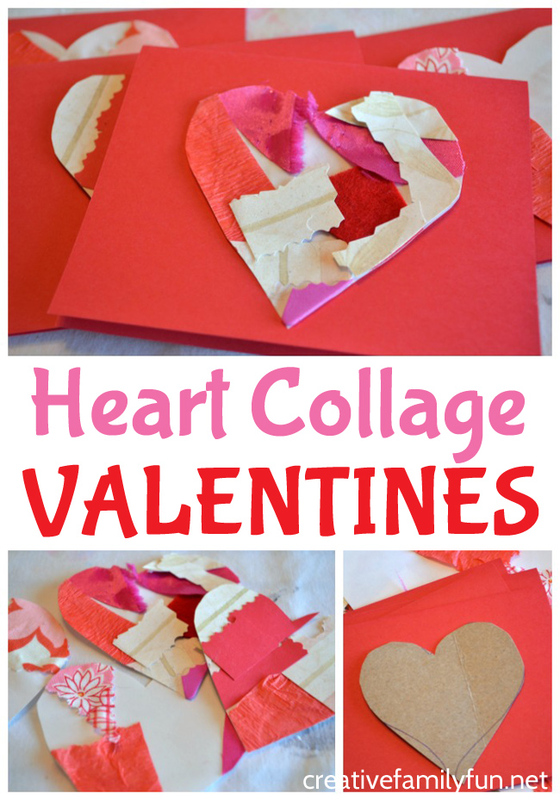 I bet there’s a special person who would love receiving one of these Heart Collage Valentines! Join our community for fun family activities!